Any study of prehistoric households requires constructing an approach for operationalizing their elucidation in the archaeological record. Households have been defined in a myriad of ways by social scientists. Depending on their definition and resulting social behavior, more than one household can be in a single building and one household can have several buildings (Wilk and Netting 1984;Wilk and Rathje 1982:620). For the purposes of this study, a widely used functional definition is employed. A household is defined as a task-oriented residence unit that shared a combination cf production, coresidence, reproductive tasks, and consumptive tasks (Netting 1982; Netting et al. 1984). Nuclear households, or simple households, generally comprise spouses and their offspring while extended families or complex households include two or more coresident married siblings or additional adult members (Blanton 1994:5;Hammel and Laslett 1974). The difficulty lies in how to identify households in the archaeological record. Architecture or the built environment provides a framework for the spatial analysis of prehistoric social organization (Kent 1990; Lawrence and Low 1990; Netting et al. 1984). Architecture fulfills a variety of social demands, organizing, regulating, and delimiting contact between individuals and households (Wilson 1988). The tangible structure of the built environment provides a focus for spatial analysis aimed at gaining insights into social organization, how social relations are reiterated, and how community organization changes over time. A major analytical problem, however, is that spatial organization is not directly related to social organization or ideology (Lawrence and Low 1990; Wilk 1990). Instead, it is imperfectly reflected in built form (for example, buildings and households are not necessarily identical), and other factors, including the specific social institutions, past historical events, and ideology play a role in the character of the built environment. In addition, the dynamic nature of architecture adds to the complexity of the issue. Buildings can be changed and modified over time to meet new or changing community needs (Banning and Byrd 1987; Goody 1958). The initial step in this process entails making inferences regarding the probable function of individual buildings and isolating those that are best interpreted as domestic units. To do so, one must examine the arrangement of space within building interiors, focusing on the location and function of internal structural features, the nature and spatial distribution of associated artifacts, and, if present, circulation paths within and between buildings. A number of discrete and continuous variables (particularly hearths and artifacts) have been correlated with different building functions in ethnoarchaeological investigations within southwest Asia (Horne 1980:23, 1994; Kramer 1982, 1983:349;Watson 1979:295). Features, for the purpose of this discussion, are considered to be the fixed construction elements or furniture within the built environment that do not have an intrinsic structural purpose (such as the walls and primary posts needed to enclose the space and support the roof). They are critical in understanding the function of buildings (Watson 1979:295). Moreover, features tend to either restrict or provide a focus for particular activities to take place, including food pro cessing, preparation, and cooking, artifact manufacture and maintenance, and storage (Whitelaw 1991;Wiessner 1982). The function of prehistoric buildings, however, is more difficult to reconstruct. Over time building function may change, and the archaeological evidence may imply only the ultimate use of the building or include a compilation of the signatures from a sequence of functions. The nature of building abandonment creates a variety of different situations as in situ artifacts are typically removed upon planned abandonment and left in place with rapid or catastrophic abandonment (Cameron and Tonka 1993). Furthermore, some economic and social functions are differentially preserved. It is not sufficient, for example, to assume that artifacts resting on or near floors reflect activities carried out while the building was in use. In dealing with this issue, it is useful to keep in mind the distinction made by Carr (1984:114) between depositional sets and areas (in the archaeologicalrecord) and activity sets and areas (in the behavioral past), in order to consider the effect that formation processes had in creating floor assemblages (Schiffer 1983, 1987). Activity area research has clearly demonstrated the role that formation processes play in the creation of depositional sets (e.g.,Brooks and Yellen 1987; Cameron 1990; Carr 1987; Hayden and Cannon 1983; Seymour and Schiffer 1987).This understanding allows one to better understand and characterize the processes that contributed to the creation of floor associated assemblages. In other words, what formation processes contributed significantlyto the correlation of particular sets of artifacts associated with building floors? For example, four types of floor artifact assemblages were distinguished at Beidha, each characterized by a different form offormationprocess and sometimes disparate archaeologicalsignatures (Byrd n.d.). These categories of floor associated assemblages include portable and nonportable in situ artifacts left as the result of sudden abandonment, nonportable in situ artifacts whose abandonment probably was not the result of a sudden event, stockpiled in situ caches of discarded raw materials and artifacts, and, finally, artifacts deposited on the floor as the result of trash dumping after building abandonment. In certain circumstances, several of these processes may have contributed to the creation of floor context artifact assemblages requiring researchers to examine these independently. Based on recent research at Beidha (Byrd 1994a,n.d. ), three classes of buildings were defined: domestic dwellings, storage facilities, and nondomestic buildings. Domestic dwellings were distinguished based on the nature of internal features, the presence of in situ artifacts for food processing and preparation, and the production and maintenance of tools and other domestic equipment. Domestic dwellings may be overrepresented, because unless there was sufficient evidence to the contrary, buildings of similar size and form were interpreted as domestic buildings. A number of criteria can be employed to discern building use: variation in building size, patterns in building construction style and morphology, the function of associated structural features, the range of activities represented by in situ artifacts on building floors, and the nature of building abandonment. Given that disasters, primarily the burning of buildings, typically provided the greatest insight into building function, interpretive emphasis can be placed on evidence derived from burned buildings and generalized to analogous buildings. Repeated patterning, be it in the presence or absence of evidence, also plays a role in inferring function. Ideally,to address the issues at hand, a restricted number of siteswould be selected that were occupied during the transition to food producing villages: from the onset of Early Natufian through the Pre-Pottery Neolithic B (12,500 to 8,000 bp). These siteswould have undergone extensive excavations, exposing many buildings with well-preserved architecture and burned buildings with floor context artifacts, and would be fully published as monographs. Thus, a study of primary contexts would provide precise information on the size of buildings, the nature of internal features, and the range of activities carried out. Each site would have been occupied over the entire time period under consideration, have multiple phases of occupation (allowing for the potential for intrasite diachronic changes), relatively well preserved buildings, and occur within a relatively restricted portion of southwest Asia. In this situation, inferences into changes in building function and the number and nature of the household could be quite strong. Unfortunately, such a data set is lacking. This study examines published architectural data from sites covering the transition, focusing on those sites with the most detailed information available in published reports. Monographs are rare, and full information on features within buildings and the nature of artifacts associated with floors is often lacking. For example, it is often difficultto discern whether hearths were present, absent, or uncertain, along with the precise nature of floor-associated artifacts. In general, the sample sizes for each time period are small, particularly for the earlier portion of the sequence.This is not an exhaustive study since some sites with architecture were excluded owing to too small a sample or the lack of suitable published information. The samples from any period are often from different environmental settings, and, where possible, these subsamples are considered separately. In addition, the end of the sequence is treated in a varied manner. 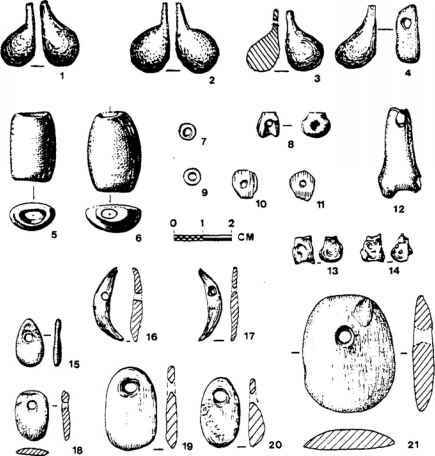 (10,600-10,100bp); and the Middle Pre-Pottery Neolithic B or PPNB (9,300/ 9200-8,500 bp) (Bar-Yosef and Meadow 1995;Byrd 1994b; Goring-Morris 1991; Kuijt 1995; Rollefson et al. 1992).The Natufian has been subdivided into the early(12,800/12,500-11,000bp) and late (11,000-10,300bp) phases, with the latter subsuming the Final Natufian (Valla 1987). 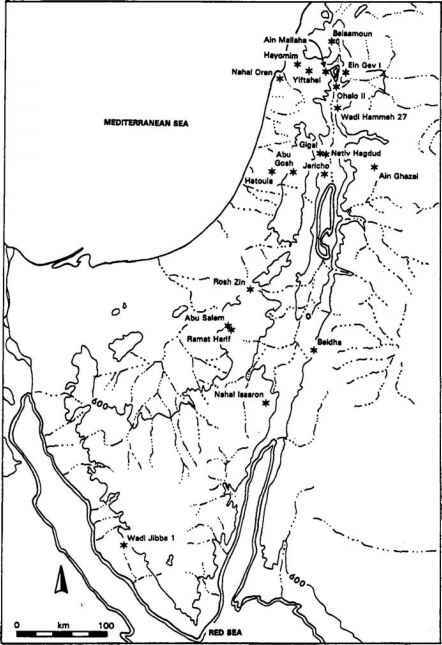 The Epi-Pale-olithic Harifian, which is limited in areal extent to the Negev and Sinai, is generally considered contemporaneous with the end of the Natufian and overlaps slightly with the onset of the PPNA (Goring-Morris 1991).Note that the Middle PPNB (from now on referred to as the PPNB) is temporally contiguous with the PPNA (Kuijt 1995). For comparative continuity in the Negev, I have also included two sites that chronologically fall within the Late PPNB. However, Late PPNB and Final PPNB sites in the highlands and Jordan Valley are not discussed since consideration of the social implications of subsequent changes in domestic architectures at these sites is outside the scope of this study. The Early Epi-Paleolithic sample includes only four buildings from two sites in the upper Jordan Valley (Fig. 8.1).A time gap exists between these and the next sample set. The Natufian period sample includes structures from five sites: one in the western highlands, one in the Jordan Valley, and three (including two Harifian sites) in the Negev. The former two sites are primarily Early Natufian, with less evidence for the Late Natufian, while the latter three are Late Natufian or Harifian in age. The PPNA sample consists of structures from five sites, three in the Jordan Valley and two in the western highlands. Finally, the PPNB sample of structures is from a more dispersed region, including two in the Jordan Valley, one in the western hills, two in the eastern hills, and two in the Negev. Figure 1. Location of sites within southern Levant used in the study. pied briefly during the Early Natufian and then reoccupied at the onset of the Neolithic (Kenyon 1981). Three phases of aceramic Neolithic occupation are generally recognized: Proto-Neolithic, Pre-Pottery Neolithic A, and Pre-Pottery Neolithic B. Based on a series of conventional radiocarbon dates, the aceramic Neolithic occupation appears to have spanned the period from 10,300to 8,600 bp (Kuijt and Bar-Yosef 1994;Walterbolk 1987).Mud-brick buildings were round during the Proto-Neolithic and PPNA and rectangular during the PPNB. Beidha is situated in the southern Jordanian highlands, just north of Petra. Prehistoric occupation includes a Natufian encampment (primarily during the thirteenth millennium bp) and a PPNB Neolithic village (during the ninth millennium bp) (Byrd n.d.; Kirkbride 1966). The Neolithic settlement consists of a small, low tell over 3 m thick, and sixty-five buildings have been excavated. Final stratigraphic analysis distinguished three phases of occupation labeled from earliest (A) to latest (C) (Byrd 1994a).